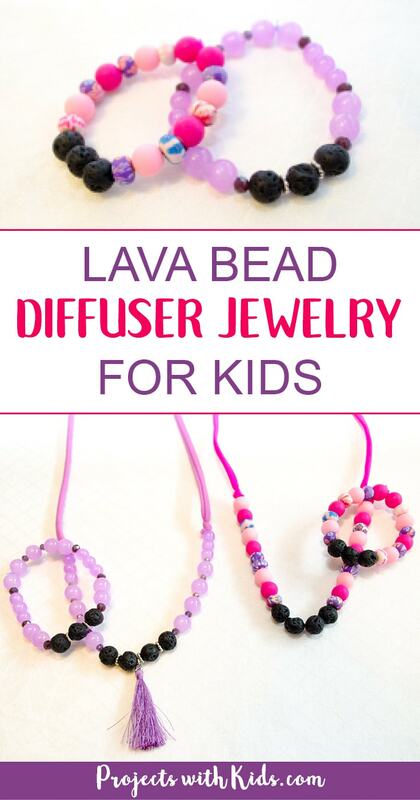 Kids will love making these lava bead diffuser jewelry sets! They make the perfect handmade gift for someone special. 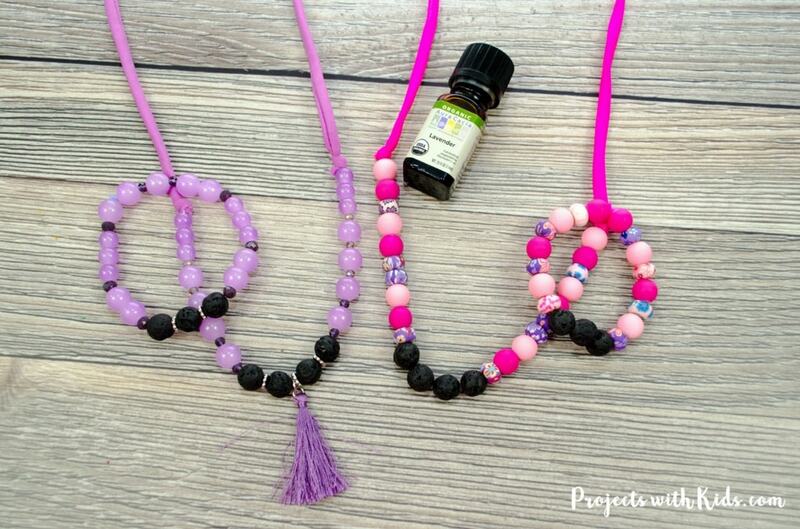 Put a couple of drops of your favorite essential oil on each lava bead (my favorite is lavender) and you have a personal essential oil diffuser with you all day! My daughter and I made these sets together, we made one set adult size and one kid size, and we had a lot of fun at the bead store choosing just the right colors and beads. 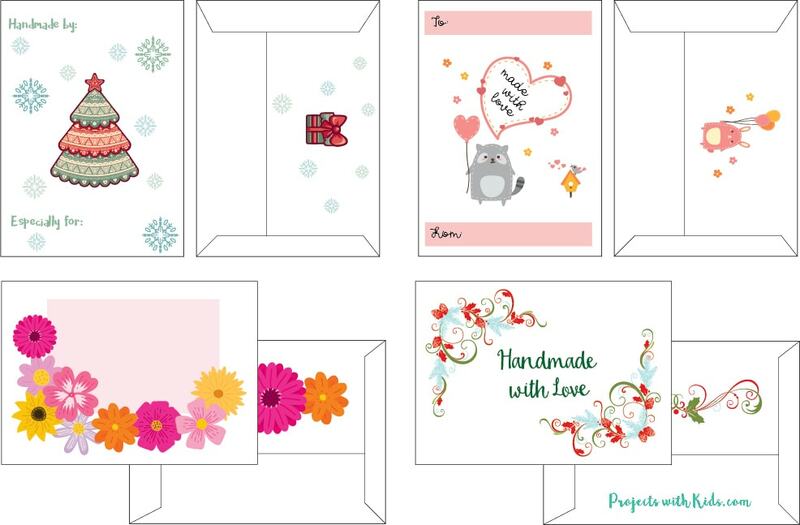 I have also made 4 different free printable gift envelopes for you to use as the perfect way to gift wrap your amazing jewelry creations! 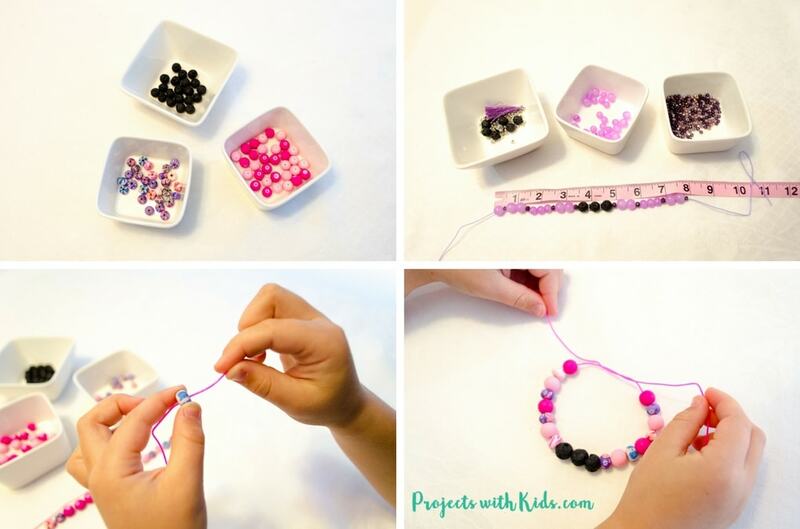 If you are looking for more DIY jewelry ideas check out these awesome friendship bracelets kids can make! 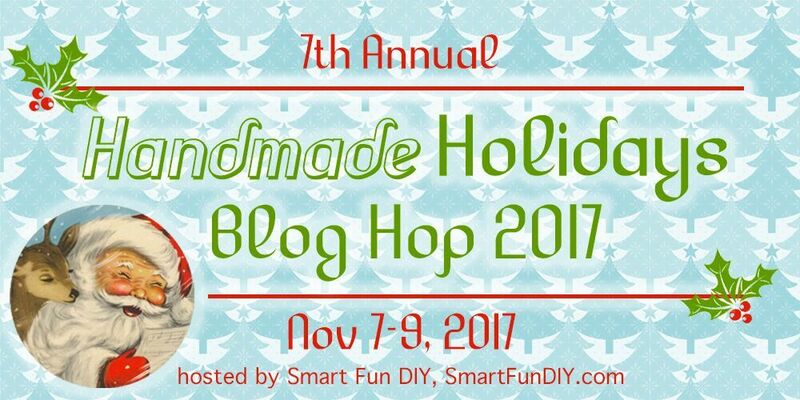 I’m so excited to be a part of the Handmade Holidays blog hop this year with talented bloggers who are sharing their handmade gift ideas, holiday decor, and holiday recipes! 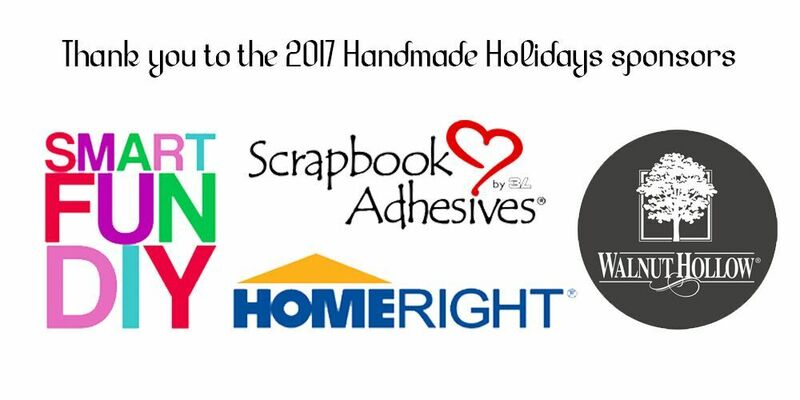 Be sure to scroll down to the end of this post to check out more handmade holiday ideas. 1. Cut your stretchy bead cord a few inches more than you need to make it easier to tie at the end. If you don’t know the exact size of the wrist you are making it for, that’s ok, using the stretchy cord allows for a bit of a range. We made our women’s sized bracelet about 9 inches and our kid-sized one about 7.5 inches. This made them fit but not too tight. 2. 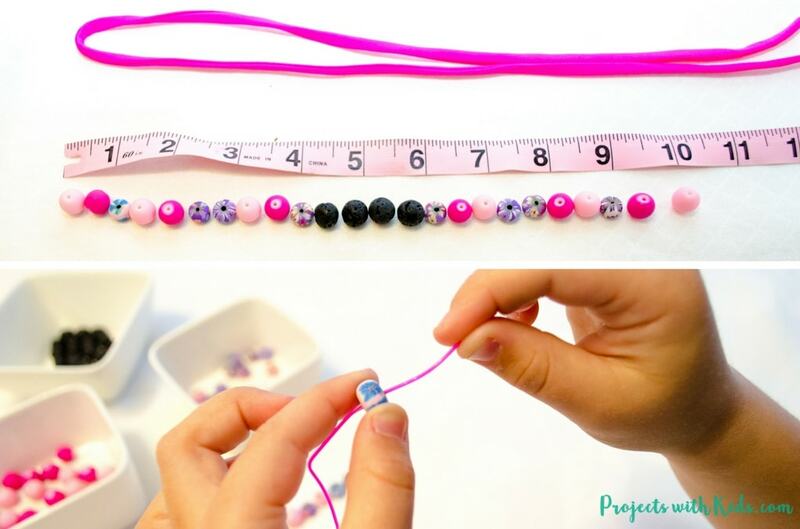 Tape one end of your stretchy cord to a table, I find this helps make it easier for kids to string the beads. 3. 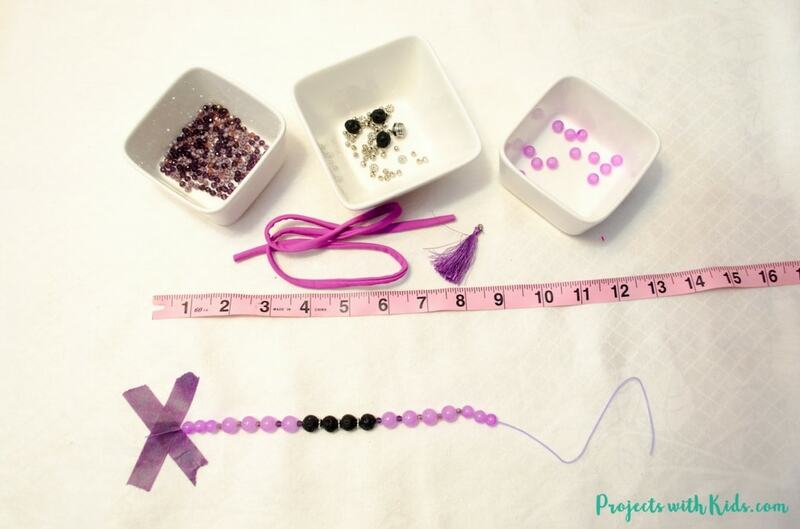 Design your bracelets and lay out your beads first, making sure to measure the length. We used 3 lava beads for each of our bracelets. Put the lava beads down first and then work your design around them. 4. 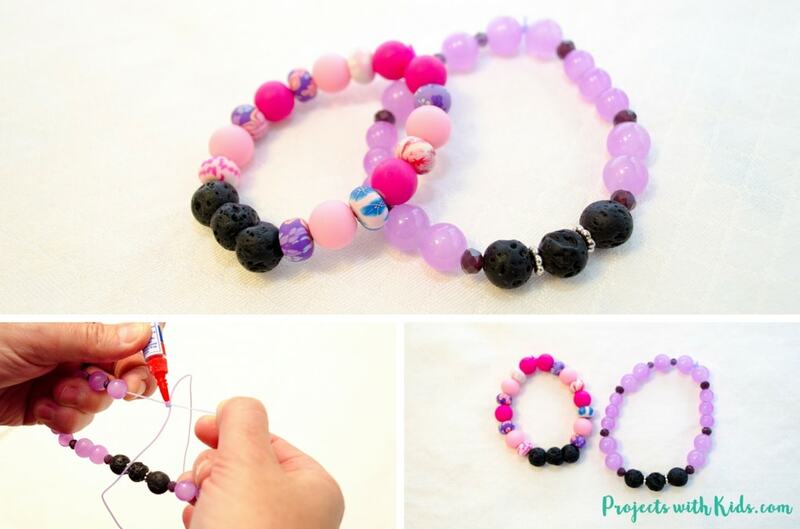 Once you are done designing your bracelet, you can string the beads. 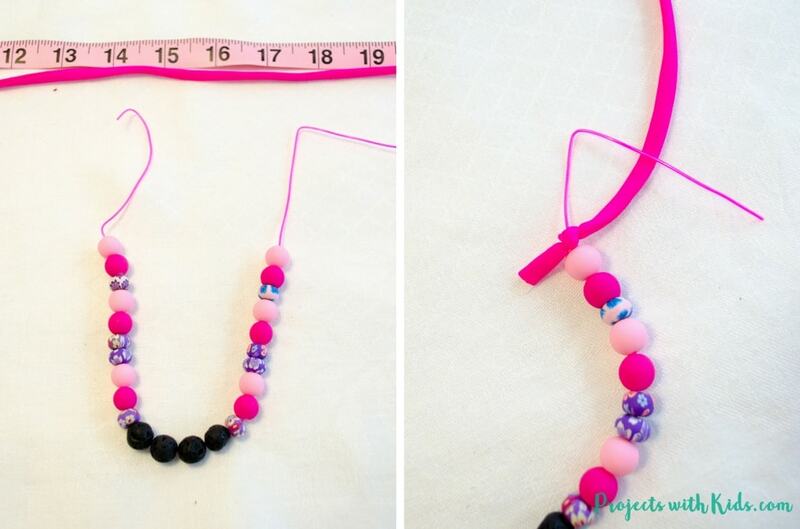 After you are done stringing your bracelet, measure it again just to make sure you have the right length. 5. Tie 2 or 3 knots in your bracelet and make sure to pull tight securing each knot as you go. Or you can use a surgeon’s knot (super easy! ), which will help keep it secure. Don’t trim the ends just yet. 6. This next part needs to be done by an adult only. You want to make sure that your knot stays extra secure, so you are going to put just a dab of super glue on the knot. You need to stretch the bracelet out a bit so no beads are touching the knot (like the picture above), dab on the glue and then hold for a minute while the glue dries. Once the glue is dry you can then trim the ends of your string. And there you go, your beautiful lava bead bracelets are finished! 1. For the necklace, you will have to decide on the type of bead string you want to use. We used a stretchy colored beading cord, that looks good with no beads on it. Other great ideas are leather cord, satin cord or ribbon. Any bead store or local craft store will have lots of options to choose from. 2. We used 4 lava beads for each of our necklaces. Again, lay out your lava beads on the table first and create your design around them. The length of your necklace is up to you, and a lot more forgiving than the bracelets. Our beaded portion of the necklaces ended up being about 8 inches, but yours can be any size you like depending on your design. 3. 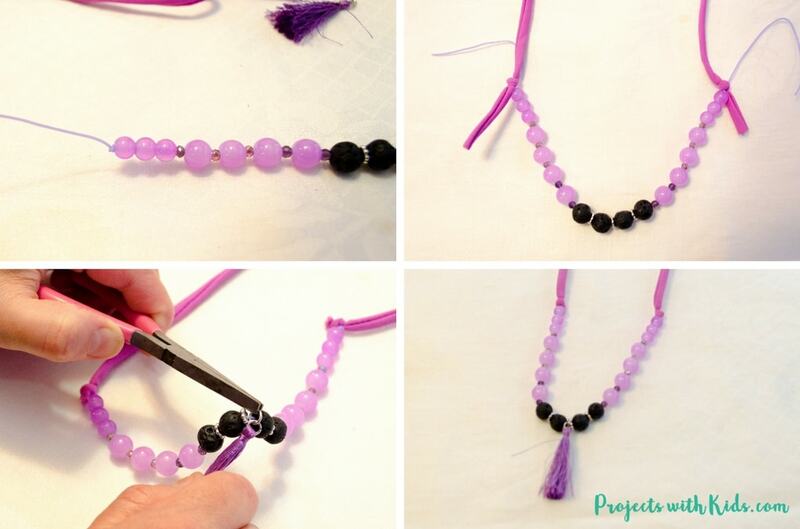 Once you are done stringing your necklace, tie a knot on both ends but don’t trim the ends just yet. You could also dab a bit of adhesive on the knots to make them extra secure. Remember to pull the beads away from the knot and hold the knot away while the glue dries. 4. Measure out the top portion of your necklace cord, leaving extra room to tie knots. Our women’s necklace cord ended up being about 19.5 inches and our kid-sized one was about 15.5 inches after everything was trimmed. 5. Tie the beaded portion to your necklace cord making sure to pull the knots tight. Depending on the type of cord that you used, you might want to put a dab of glue on the knots to help keep them secure. 6. Next, you want to trim the ends of all your strings. 7. If you have any embellishments to put on, you can do that now. I put a tassel on the purple necklace and it looks really great! Any type of charm or initial would also look nice. I used beading pliers for this part, so it’s best if an adult does this. You now have a beautiful diffuser jewelry set ready to give to someone special! If you want to gift wrap it in a unique way, I have 4 free printable gift envelopes that are perfect to put your jewelry sets in! You can download them here as part of my resource library by signing up for my email. Four free designs to choose from! Fold over the side flap and glue, fold over the bottom flap and glue. Once you have put your gift inside, secure the top flap with some washi tape. If you are looking for more awesome DIY jewelry projects that would also make great gifts, check out these sparkly polymer clay stamped necklaces! Or make a pretty jewelry dish to go with all of your creations. Follow my Handmade Gift Ideas Pinterest board for more great ideas! Don’t forget to click on the link below to check out more amazing Handmade Holiday ideas! These are so great! I need to make a few I think. I’m happy to see a kid craft on this hop! My daughters will love this project. Thanks for sharing! Fragrance and jewelry is a winning combination! Thank you Beverly, I also love that one! Very cute diffuser jewelry and thanks for the gift envelopes. Very neat! I’d love any gift that brings more sleep and calm, lol! Visiting from Handmade Holidays. I have never heard of these before. What an interesting gift idea! These are beautiful! I love essential oils and might have to try this. Great idea as usual.Very creative! Pinned and shared on both my personal and Blog page. Omg how cute!!!! I love how colorful the beads are!!!! These are so awesome! 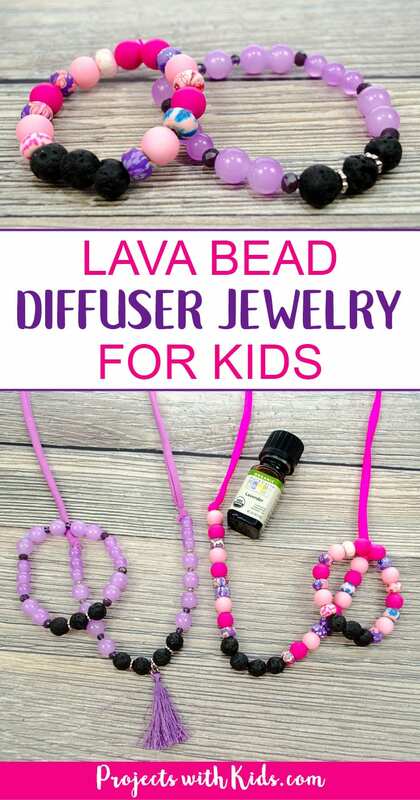 I’ve never heard of lava beads before, so I’ll have to buy some. I’ve just started using oils on my son to calm him down, and they really work. I’d love to make him a bracelet, and have him make some as presents too. Great idea! So cute, and I love that you can customize the color and scent for each person. What a great craft to make with your kiddos. What a cool idea for doing with the kiddos. They love to make things and will be so proud of their creation. Thank you for the gift envelopes too. Thanks for the giveaway! Love those lava beads! Will have to check them out next time I’m in Michaels! You’re welcome Bree! I love the bead section at Michaels, so many cool beads and ideas! Those lava beads are really cool looking. 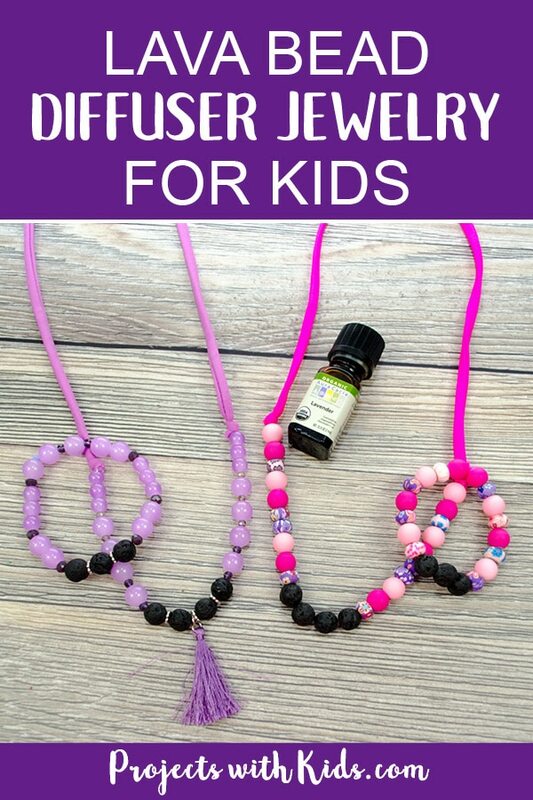 And thanks for the good tips on making a bead necklace. My kids will have so much fun with this. Very pretty. My favorite would be lavender as well. Such a lovely idea! I love the jewels and the lavender is just awesome!